Habitat: The Clove is native to the North Moluccas, the Spice Islands of Indonesia. It is cultivated in Mauritius, Madagascar, India, Sri Lanka, Zanzibar, Brazil, the West Indies and Pemba. 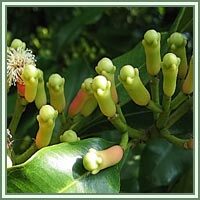 Description: The Clove tree is an evergreen that grows to a height ranging from 8-12 m, having large square leaves and sanguine flowers in numerous groups of terminal clusters. The flower buds are at first of a pale color and gradually become green, after which they develop into a bright red, when they are ready for collecting. Cloves are harvested when 1.5-2 cm long, and consist of a long calyx, terminating in four spreading sepals, and four unopened petals which form a small ball in the center. Parts used: The dried flower buds. Useful components: Essential oil ( Eugenol- the main active compound ), distilled from dried flower buds. Medicinal use: Cloves are used as a carminative, to increase hydrochloric acid in the stomach and to improve peristalsis. 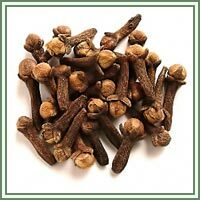 Cloves are also said to be a natural anthelmintic. The essential oil is used in aromatherapy when stimulation and warming are needed, especially for digestive problems. Topical application over the stomach or abdomen are said to warm the digestive tract. The use of a Clove in toothache is also said to decrease pain. It also helps to decrease infection in the teeth due to its antiseptic properties. Clove oil, applied to a cavity in a decayed tooth, also relieves toothache. Cloves may be used internally as a tea and topically as an oil for hypotonic muscles, including for multiple sclerosis. Safety: Clove essential oil is very potent and care should be taken when using it as it can irritate the skin. Therefore it is highly advisable to contact your doctor/herbalist before consumption of any herb.